At a sprawling 5,360-square-feet, this single-family home is the paragon of comfortable country living, with a modern elegant twist. 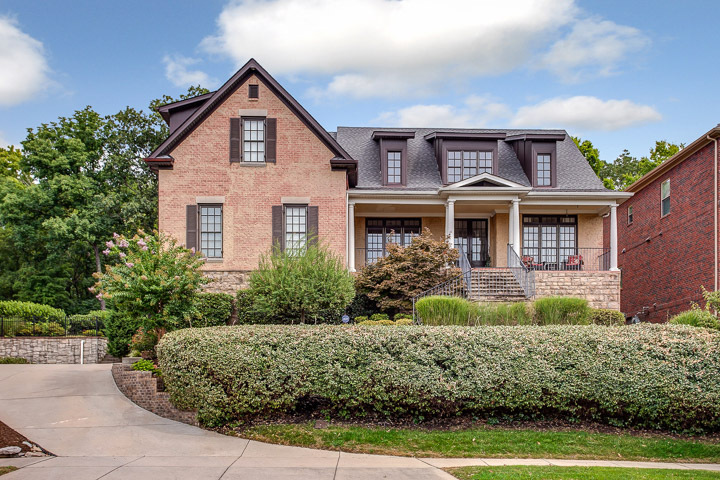 Located in one of the most unique gated communities in Williamson County, Ashton Park, this property is zoned for Kenrose Elementary, Woodland Middle and Centennial High School. All of these schools have been highly praised by parents and students, and are capable of tapping into every student’s full potential. The house contains five bedrooms, four full bathrooms and a four-car garage, in addition to plenty of yard space for friends and family. From the picturesque front-view to the charming backyard, this house is ideal for both making childhood memories and entertaining crowds of all sizes. The front porch is the first thing that greets visitors, with tall white columns and beautiful windows, outlined in contrast from the brick wall. There is room for chairs to lounge in, as well as small potted plants and decorative pieces to share with guests a glimpse of what’s to come. Guests enter into the front hall, which is extremely spacious and open on both sides. An enormous opening into the adjacent dining room provides excellent sight lines, and the French front doors and large windows provide a beautiful amount of natural light, giving the room a refreshing and open feeling. All of the flooring is a stunning hardwood, and there is ample room left to decorate in any manner. The adjacent dining room features a large amount of natural lighting from the ceiling length windows and beautiful chandelier. There is a large amount of extra room for a dining table of any size, and is perfect for large parties or intimate family dinners. In addition, there is wall space and extra room for other decorations, to make your dining room truly unique to your own family. The den room is enormous, and features very high ceilings and a glimpse upstairs through the railing. There are windows for natural lighting and a ceiling fan equipped with electric lights. In addition, this room features a fireplace, for those colder days and for Christmas, and plenty of room for couches and armchairs and coffee tables of all styles. This house is equipped with an extensive chef’s kitchen, equipped with many modern luxuries and extra room for an eat-in kitchen. This beautiful space is lit with natural lighting and inset ceiling lights, as well as two hanging lights — one over the kitchen island, and another over the eat-in area. This space is perfect for chefs of all experience levels, and is a comfortable spot for the family to lounge around and share stories of their day. The living room is a comfortable space tucked close to the back of the house, and is extremely flexible in becoming anything that suits any sort of needs. There are plenty of windows and a ceiling fan, and the room is very open to the eat-in kitchen and the kitchen itself, providing beautiful sight lines into the rest of the house and truly opening up the space available there. There is a door to access the porch through, and enough room for couches, televisions or any type of customization. There are two main bedrooms in his house — both of which are spacious and intimate. They both feature windows on multiple walls, equipped with blinds, and a ceiling fan hanging off a very, very high ceiling. There is ample room for a bed and even a sitting area that can be used for any purposes. The master bathroom is large, with two wall lights and a large, glass shower. The sinks are his-and-hers styled, with a corresponding mirror and sink for those busier mornings when time is of the essence. This room also has a sloping ceiling, and the effect truly opens it up and gives residents more room to breathe and relax after a long day of work. This house also features an elevator, which can be used by all residents but is extremely useful for residents or visitors that would prefer to not walk up and down stairs. It is large enough to accommodate multiple people and wheelchairs, and is both an efficient and elegant touch for this house. Very uniquely, this house also includes a full, finished basement. Previous residents have used it in the past as a recreation room, complete with a small kitchen area and a bathroom — as well as a gym and workout space. This area is extremely flexible and can easily be used for any other purposes, whether it be for entertaining or relaxing, or an office space for receiving customers and guests. The backyard is expansive and has a covered porch, with room enough for tables and chairs to recline on, as well as a fountain and a fire pit for parties and casual summer nights. There is room enough here for pets and children, guests and family. This is the picturesque area to entertain, and is a memorable feature for anyone visiting or living extensively. This stunning home is currently listed at $724,900, and there is an open house scheduled for Satuday, Aug. 22 from 2-4 p.m.
For more information, contact Paula Hinegardner from Keller Williams Realty at 855-572-2079 or visit the house’s listing page.